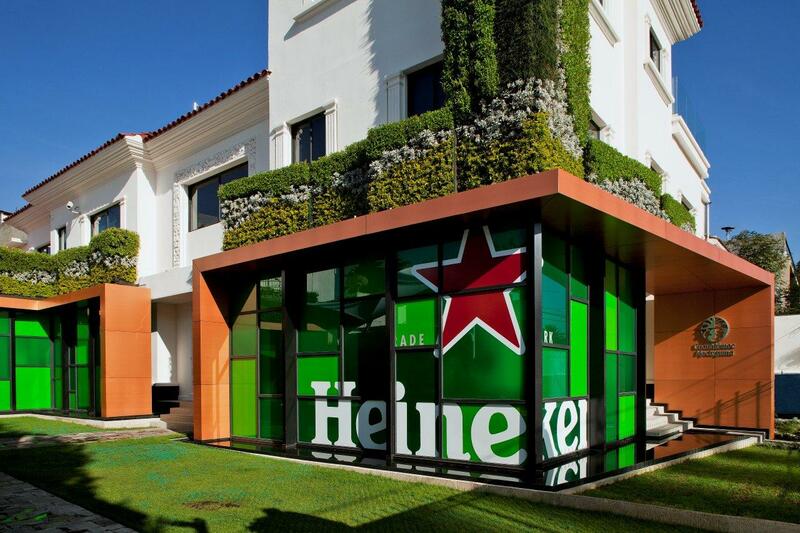 The project for the Heineken bar and corporate offices of Cuauhtémoc Moctezuma Heineken Mexico located in a big house in the Polanco area of Mexico City —catalogued as historic patrimony by INBA— was selected through a competition organized by the client. It was very important that the original and main architectonics features of the residence were preserved and at the same time incorporate, in a very contemporary trend, the brand image by creating the office areas and the Bar House for special guests and tastings. The main facade with classic ornaments remained untouched. The original partitions of the perimeter wall were partially covered with shade glass that gives privacy and shows a glimpse of the house architecture. 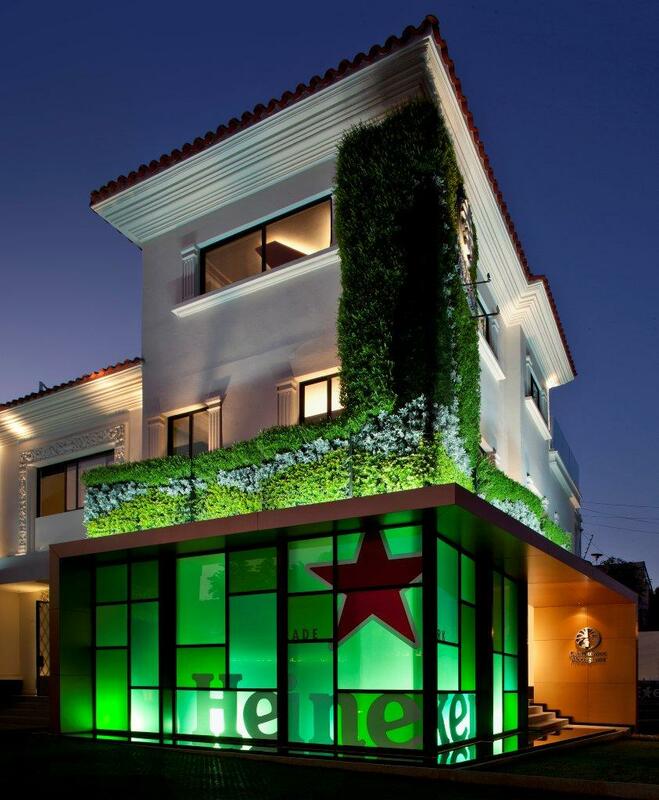 A big copper marquee covered, with double glass in different shades of green and the logo, is on top a water mirror creating a reflecting and subtle brand presence at the entrance. The marquee also has on top a big green wall shaped as a bottle that is spilling foam all the way to the bottom. In order to have more room for the events, the parking area was covered with a curved shaped architectonic canvas creating an extra terrace. The paving was done with archeological stone that climbs up the walls and finishes in flower boxes. The access to the interior is through a lock with elements evoking the brand, green glasses, a suspended plafond made of red aluminum, black aluminum frame panels and skylights showing the product. 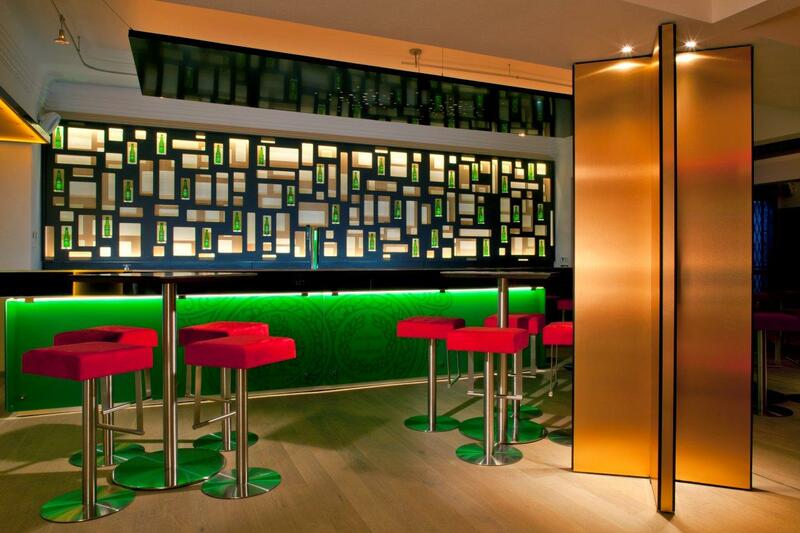 All these are suspended by a great glass wall that shows the bar, the main feature of the lounge. An aluminum bench by Davis greets the guests at the front of the reception. This area shows materials and forms that resemble a great bear barrel surrounded by curved glass screens with the logo and are randomly showered by a rain of bottle caps. The grand hall of the house is presented after the lock and has a magnificent double height and a curved staircase, an important characteristic of a residence from this time. The staircase is covered with oak wood oiled in natural color and chocolate black. 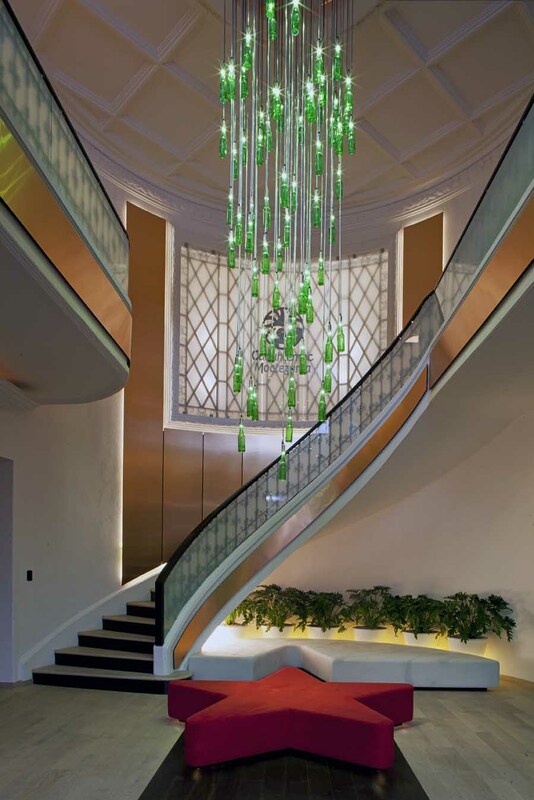 From the ceiling, at the center of the space, a massive chandelier made of beer bottles cascades on top of a star shaped red bench with the brand´s logo. Towards the terrace access there are two spaces joined by a lighted amber glass frame continuing to a large single piece bar made of black glass and a foundation with a green lighted front decorated with the brand shields. 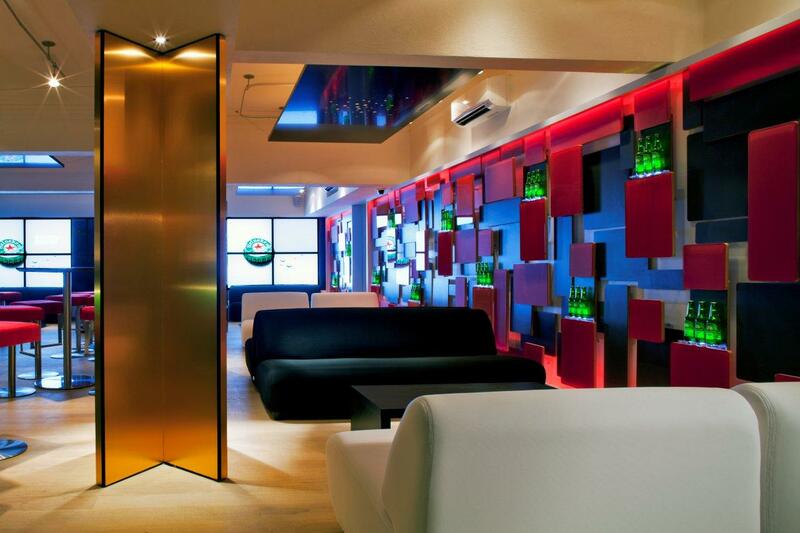 At the end there is another bar with a screen that displays the product through a series of shadows and RGB led lights. Black aluminum frame suspended plafonds, with perforated sections, give shelter and frame to the original ceilings and cornices. 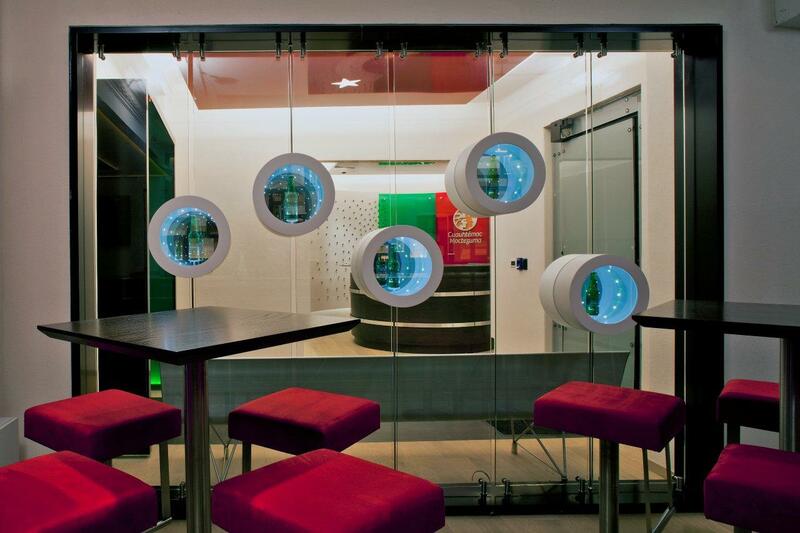 These spaces are complemented by a lounge area with high tables, stools and sofas that ends in a screen like wall made of red glass and niches for product display. The area also has a grand HD Video Wall that adds information and color in motion for the different events. All the floors are made with oak wood oiled in natural color adding a rustic touch that evokes the old beer barrels. Two columns of the copper material in X shape enclose the access to the sitting areas. The lavatories have a theme décor. 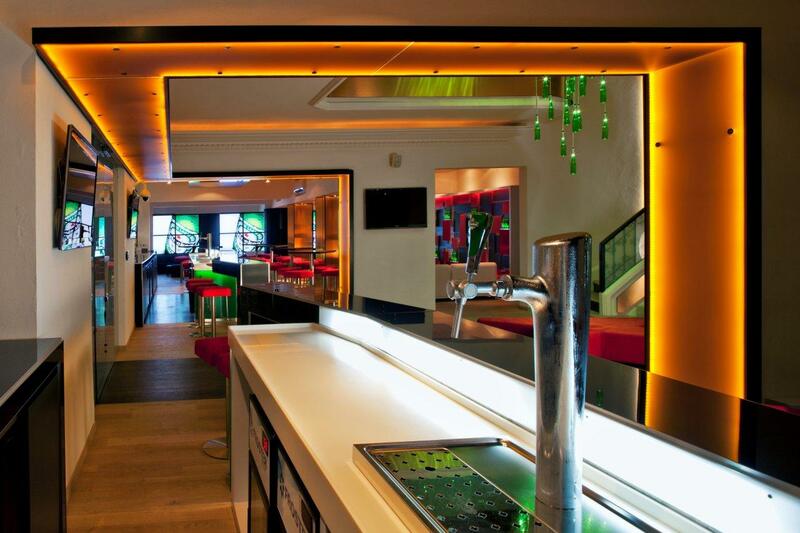 Men lavatories have a green shade color lighting that comes from a suspended aluminum panel plafond in copper color and glass screens with hop graphics, beer main ingredient. 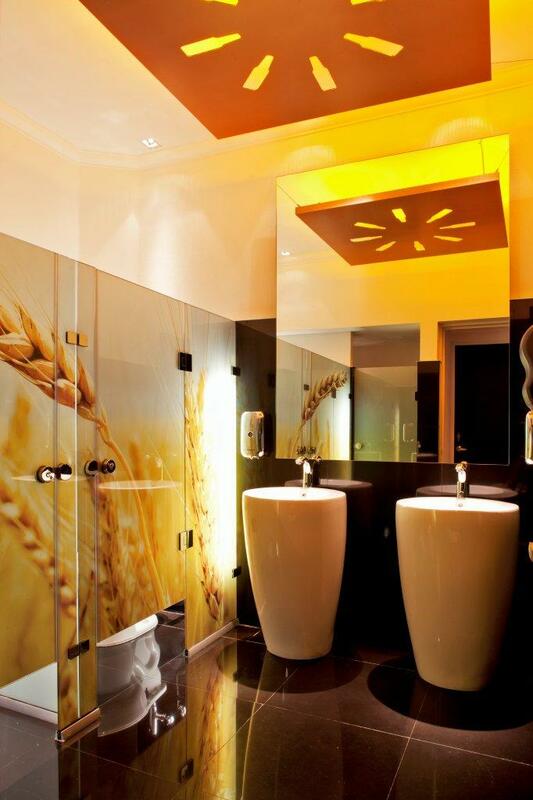 Women lavatories have lighting in amber shades and glass screens with barley graphics. The offices are located in the second level going up the grand curved staircase that has leading emphasized by the use of coppered panels with the logo at the center. The original forge is covered with fog glass insinuating the design and giving a contemporary touch to the general ambiance. 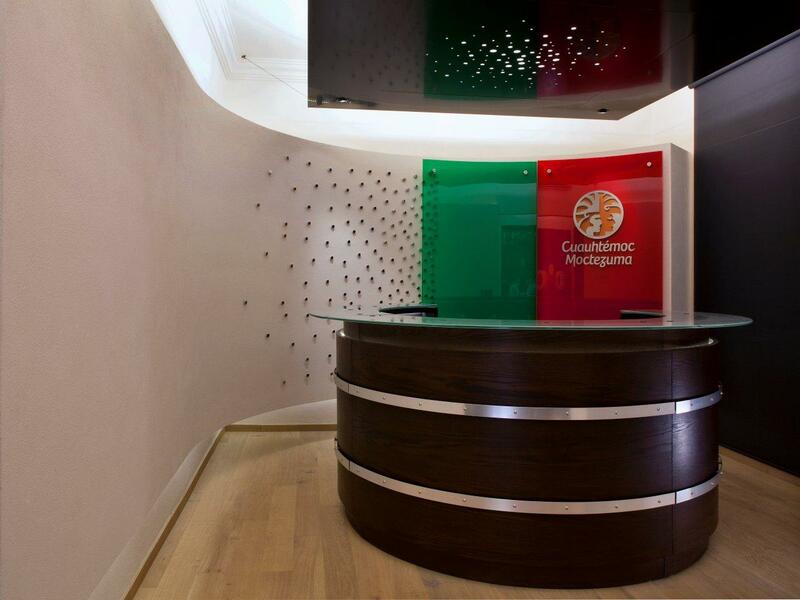 At the end of the first lever area the reception desk is located and was designed using a lighted panel made of bottle tops perfectly aligned. On one end the videoconference room is located and has a suspended black plafond that also holds monitors, cameras and the general lighting system. 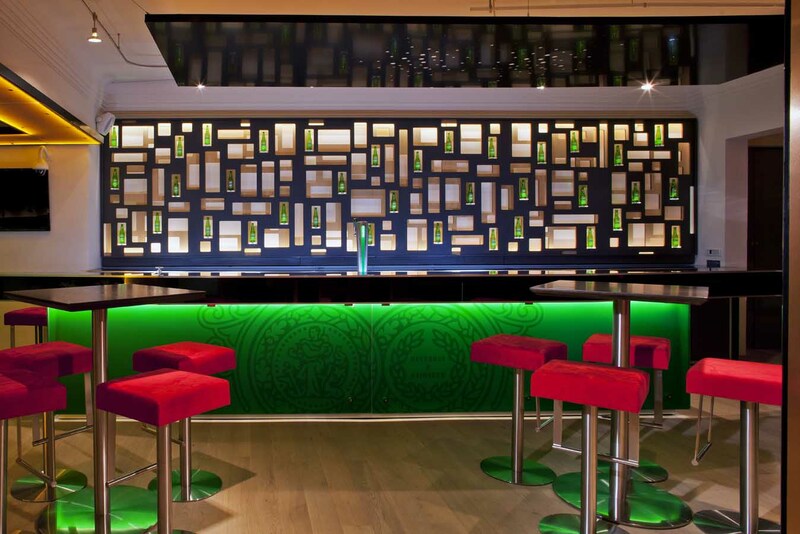 The walls are covered by a lighted green glass paint board decorated with graphic bottle shapes. The windows are covered by roll up black blinds that go from floor to ceiling. 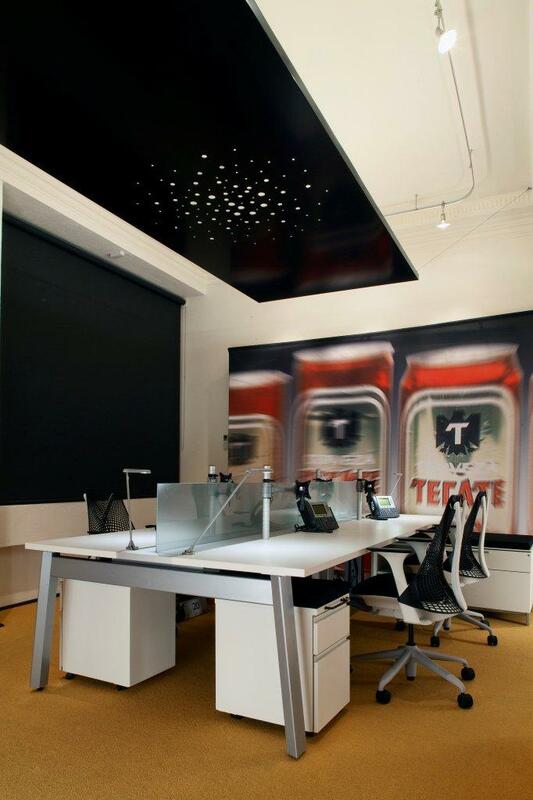 The offices have black perforated suspended plafonds that hold the lighting system. The furniture is Herman Miller simple and sober but highly efficient, with a center work table and furniture located towards the walls for the personal tasks. 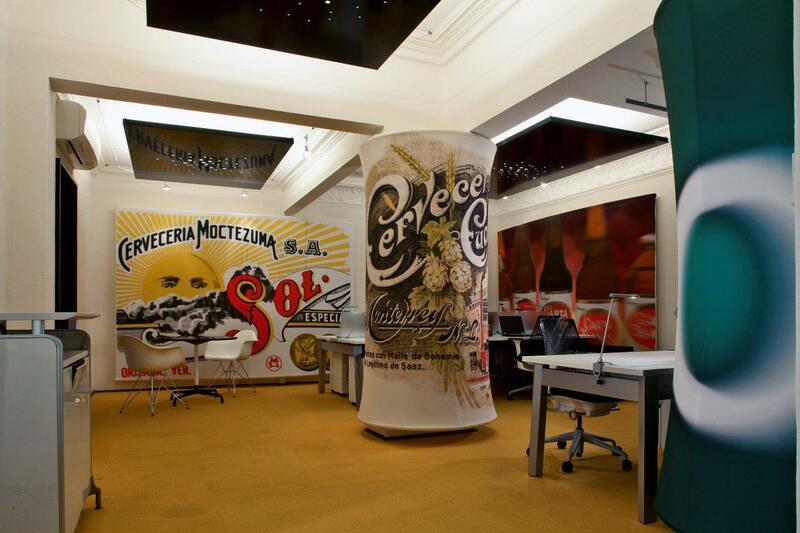 Floors are covered with a yellow modular carpet making contrast with the sand white of the walls that recall the beer foam. The access doors are made in shade class to have both privacy and control. The windows are also covered in roll up floor to ceiling blinds. 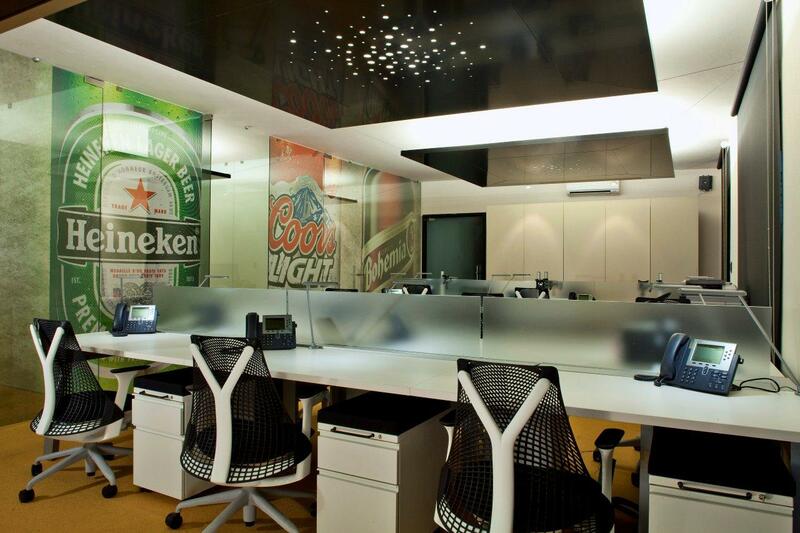 The working areas, also with Herman Miller furniture, show in the walls all the branding of the company from the contemporary brands to the vintage ones printed in fabric screens that add warmth to the area. The presence of the yellow carpet and white sand walls maintain the general concept of all the spaces. In the third level the main conference room is located, as well as the CEO office that has an area for personal tasks and a meeting table that may be used for team work. 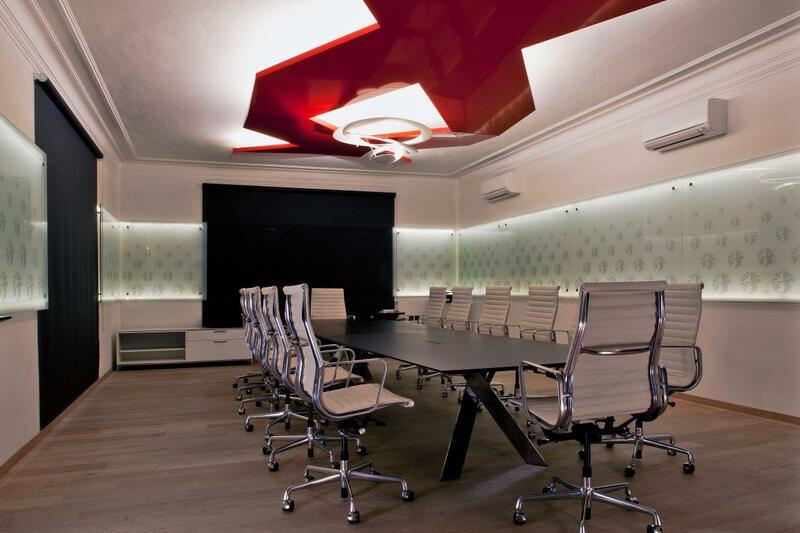 A suspended plafond highlights and adds the corporate presence by the X shape and the red color, one of the main brands. 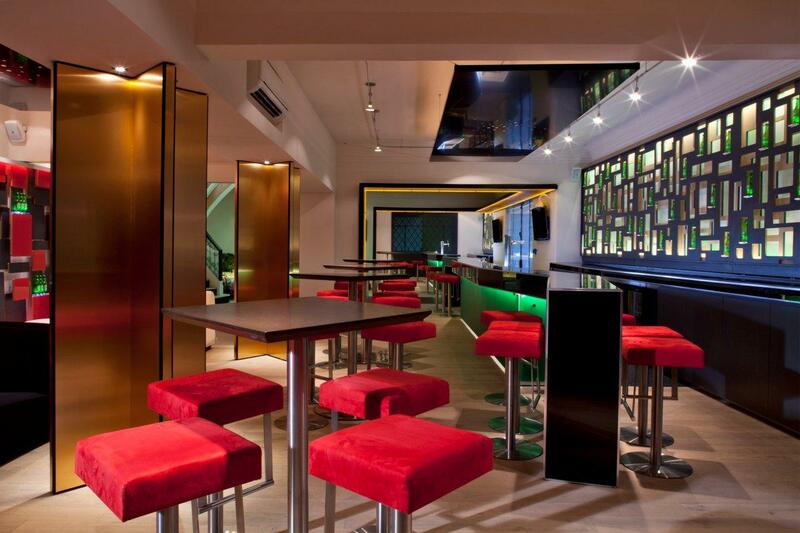 It also has a private terrace with wood floors and glass screens covered with graphics that make the perfect ambiance for evening meeting and events. A roof garden was also done in this area for private council meetings, covering the unwanted views by the use of green curved walls and emphasizing the spectacular ones with glass screens. Lightingdesign: Noriegga Iluminadores Arquitectónicos Mexicanos.